The integration of fossils, phylogeny, and geochronology has resulted in an increasingly well-resolved timetable of evolution. Life appears to have taken root before the earliest known minimally metamorphosed sedimentary rocks were deposited, but for a billion years or more, evolution played out beneath an essentially anoxic atmosphere. Oxygen concentrations in the atmosphere and surface oceans first rose in the Great Oxygenation Event (GOE) 2.4 billion years ago, and a second increase beginning in the later Neoproterozoic Era [Neoproterozoic Oxygenation Event (NOE)] established the redox profile of modern oceans. The GOE facilitated the emergence of eukaryotes, whereas the NOE is associated with large and complex multicellular organisms. Thus, the GOE and NOE are fundamental pacemakers for evolution. On the time scale of Earth’s entire 4 billion–year history, the evolutionary dynamics of the planet’s biosphere appears to be fast, and the pace of evolution is largely determined by physical changes of the planet. However, in Phanerozoic ecosystems, interactions between new functions enabled by the accumulation of characters in a complex regulatory environment and changing biological components of effective environments appear to have an important influence on the timing of evolutionary innovations. On the much shorter time scale of transient environmental perturbations, such as those associated with mass extinctions, rates of genetic accommodation may have been limiting for life. The final stop in this whirlwind tour of the evolutionary timetable is ourselves. The ages of hominin (the lineage leading to Homo sapiens, sister to chimps and bonobos) fossils are estimated on the basis of high-resolution geochronology (mostly 40Ar/39Ar) on ash beds intercalated among fossiliferous sediments, supplemented by a well-calibrated magnetic stratigraphy. Although rare, early hominins have been found in several localities in Africa, with ages of around 6 million years, and a recent discovery suggests human-gorilla divergence as early as 8 Ma (83). In turn, the oldest fossil attributed to the genus Homo is a mandible with teeth, found in siltstone 10 m above a 2.822 ± 0.006–Ma ash bed but older than a superjacent tuff dated at 2.669 ± 0.011 Ma (84); the fossil in question combines features characteristic of Homo and Australopithecus, raising the question of how we should define our own genus (85). In Kenya and Ethiopia, possible Homo erectus bones have been discovered just below an ash bed dated at 1.87 ± 0.02 Ma (86, 87), and both a more securely identified H. erectus cranium and Acheulian stone tools (generally associated with H. erectus in Africa) occur just above a 1.74 ± 0.06–Ma ash bed (88). H. erectus remains in Asia independently indicate an origin of more than 1.7 Ma (89, 90). Anatomically modern humans (Homo sapiens sapiens) emerged after 200,000 years ago [constrained by 40Ar/39Ar ages of 196 ± 2 thousand years on volcanic ash within a fossiliferous unit (91)], dispersing to the Levant by 100,000 years ago and, later, around the world. Uncertainty in dates for human dispersal reflects both the limited availability of fossils and differing opinions about what constitutes a modern human [summarized by Grove (92)], but recent molecular clock analyses suggest that the ancestors of modern Eurasian populations migrated from Africa 50,000 to 70,000 years ago, with Papuan genomes suggesting a small admixture of genes from a population that migrated earlier but is now extinct (93–95). From there, it is but a geologically short hop to agriculture (ca. 11,500 years ago) and onward to the Industrial Age technologies and exponential population growth that has established our species’ unprecedented ecological footprint on Earth system. A GW researcher’s paper challenges the claim that the genus Homo originated in response to environmental changes. An often cited claim that humans, who are smarter and more technologically advanced than their ancestors, originated in response to climate change is challenged in a new report by a Center for the Advanced Study of Human Paleobiology researcher at George Washington University. Many scientists have argued that an influx, described as a “pulse,” of new animal species appear in the African fossil record between 2.8 and 2.5 million years ago, including our own genus Homo. Experts believe it takes a broad-scale event like global climate change to spark the origination of so many diverse new species. However, W. Andrew Barr, a visiting assistant professor of anthropology, published a report that says it’s possible the pulse of new species could have occurred by chance and might not be directly related to climate change. It is generally accepted that when major environmental changes occur, some species will go extinct and others will originate, which can create a cluster or pulse of new species in the fossil record. However, there is not a set definition of what is considered a pulse, so experts have disagreed about which clusters constitute meaningful events and which can be explained as random fluctuations. Dr. Barr used computer simulation to model what the fossil record might look like over time in the absence of any climate change and found clusters of species originations that were of similar magnitude to the clusters observed in the fossil record. This means random patterns are likely under-credited for their role in speciation fluctuation, he said. Dr. Barr’s findings mean scientists may need to rethink widely-accepted ideas about why human ancestors became smarter and more sophisticated. He compared the pattern to flipping a coin. If you flip a coin 100 times, you would expect to record 50 heads and 50 tails. However, if you are only looking at 10 coin flips, you could see a greater imbalance, instead recording seven heads and only three tails. This would even out over time, but in the short-run, you could see clusters of these independent coin flips, he said. Similarly, fluctuations in turnover in Dr. Barr’s model are pronounced, but are caused purely by random processes. “The idea the the origin of Homo is part of a climate-caused turnover pulse doesn’t really bear out when you carefully look at the evidence and compare it against other possible explanations,” Dr. Barr said. This research challenges scientists to be careful about the stories they tell about the history of human adaption, Dr. Barr said. Traits that make humans different from our ancestors, like larger brains and greater technological sophistication, could have arisen for a variety of reasons, he said. A nearly complete skull of a mysterious member of the human family was unveiled this week at the same time as researchers reported a surprisingly recent age for this ancient cave dweller in South Africa. The new fossils of Homo naledi reinforce a picture of a small-brained, small-bodied creature, which makes the dates reported in a paper in eLife all the more startling: 236,000 to 335,000 years ago. That means a creature reminiscent of much earlier human ancestors such as H. habilis lived at the same time as modern humans were emerging in Africa and Neandertals were evolving in Europe. “This stuff is a time and a half older than anything else put forward as H. sapiens,” says paleoanthropologist John Fleagle of the State University of New York in Stony Brook. The discoveries, reported in Nature, suggest that our species came into the world face-first, evolving modern facial traits while the back of the skull remained elongated like those of archaic humans. The findings also suggest that the earliest chapters of our species’s story may have played out across the African continent. “These hominins are on the fringes of the world at that time,” says archaeologist Michael Petraglia of the Max Planck Institute for the Science of Human History in Jena, Germany. Last edited by Jo Bowyer; 04-08-2017, 08:23 PM. Historically, two key models have been put forward to explain the evolution? of Homo sapiens. These are the ‘out of Africa’ model and the ‘multi-regional’ model. The ‘out of Africa’ model is currently the most widely accepted model. It proposes that Homo sapiens evolved in Africa before migrating across the world. On the other hand, the ‘multi-regional’ model proposes that the evolution of Homo sapiens took place in a number of places over a long period of time. The intermingling of the various populations eventually led to the single Homo sapiens species we see today. VANCOUVER, CANADA—For years archaeologists have searched for a sign of the earliest Americans—the mysterious newcomers who, it’s generally believed, set out from Asia and spread down the Pacific coast by boat more than 14,000 years ago. Last week, at a jammed session of the meeting of the Society for American Archaeologists here, researchers proposed that such evidence has been under their noses all along. They argued that a staple of museum collections known as Western Stemmed points—roughly pinkie-sized stone spearpoints with a chunky stem—are the handiwork of those first arrivals. The Western Stemmed tradition “is finally coming into its own,” says Michael Waters, an archaeologist at Texas A&M University in College Station. Stemmed points—which have been found up and down the Pacific coast and across the western United States—and the methods associated with making them appear to be coalescing into “an ancient coastal tradition,” says Quentin Mackie, an archaeologist at the University of Victoria in Canada. Archaeologists once thought the so-called Clovis people were the first in the Americas. These big game hunters spread their Clovis spearpoints—long and thin with distinctive hollows carved into both sides of the base—across the United States and northern Mexico starting about 13,000 years ago, when they arrived via an ice-free corridor through glacier-covered Alaska and western Canada. But then scientists discovered human occupation as far south as Chile dated to before 14,000 years ago—before the ice-free corridor even opened. The Clovis-first model collapsed in favor of a fuzzy picture of coastal migrants. But direct evidence of their presence remains elusive. Western Stemmed points were once considered cruder, later cousins of the larger and more sophisticated Clovis points. But an early hint that some stemmed points might be older emerged in 2012, when a team reported 11,300-year-old examples in Oregon’s Paisley Caves. That made them as old as any Clovis points in this region, and maybe older. Archaeologist Dennis Jenkins of the University of Oregon in Eugene, the first author of that paper, later found Western Stemmed points buried even deeper in the cave, in layers he thinks are more than 14,000 years old. He’s waiting for radiocarbon dates. The stone detritus the pointmakers left behind is now adding to the evidence that Western Stemmed points arrived first. To make one, you knock off the top of a round stone, creating a flat surface. Then you strike that surface to chip off sharp flakes, and finish the job by carving the base of a flake into the telltale chunky stem. As a pointmaker popped off more and more flakes, the remaining stone took on a distinctive shape: a “discoidal core” that looks nothing like the relics of Clovis pointmaking, in which blades are stripped off from the sides of a stone. So it’s unlikely that Clovis could be the precursor of this technology, researchers say. “The garbage left behind by these two technologies is radically different,” Jenkins says. Last edited by Jo Bowyer; 04-08-2017, 08:15 PM. TV review: Horizon: Are We Still Evolving? There is much debate on the dietary adaptations of the robust hominin lineages during the Pliocene-Pleistocene transition. It has been argued that the shift from C3 to C4 ecosystems in Africa was the main factor responsible for the robust dental and facial anatomical adaptations of Paranthropus taxa, which might be indicative of the consumption of fibrous, abrasive plant foods in open environments. However, occlusal dental microwear data fail to provide evidence of such dietary adaptations and are not consistent with isotopic evidence that supports greater C4 food intake for the robust clades than for the gracile australopithecines. We provide evidence from buccal dental microwear data that supports softer dietary habits than expected for P. aethiopicus and P. boisei based both on masticatory apomorphies and isotopic analyses. On one hand, striation densities on the buccal enamel surfaces of paranthropines teeth are low, resembling those of H. habilis and clearly differing from those observed on H. ergaster, which display higher scratch densities indicative of the consumption of a wide assortment of highly abrasive foodstuffs. Buccal dental microwear patterns are consistent with those previously described for occlusal enamel surfaces, suggesting that Paranthropus consumed much softer diets than previously presumed and thus calling into question a strict interpretation of isotopic evidence. On the other hand, the significantly high buccal scratch densities observed in the H. ergaster specimens are not consistent with a highly specialized, mostly carnivorous diet; instead, they support the consumption of a wide range of highly abrasive food items. Appetitive-searching (reward-seeking) and distress-avoiding (misery-fleeing) behavior are essential for all free moving animals to stay alive and to have offspring. Therefore, even the oldest ocean-dwelling animal creatures, living about 560 million years ago and human ancestors, must have been capable of generating these behaviors. The current article describes the evolution of the forebrain with special reference to the development of the misery-fleeing system. Although, the earliest vertebrate ancestor already possessed a dorsal pallium, which corresponds to the human neocortex, the structure and function of the neocortex was acquired quite recently within the mammalian evolutionary line. Up to, and including, amphibians, the dorsal pallium can be considered to be an extension of the medial pallium, which later develops into the hippocampus. The ventral and lateral pallium largely go up into the corticoid part of the amygdala. The striatopallidum of these early vertebrates becomes extended amygdala, consisting of centromedial amygdala (striatum) connected with the bed nucleus of the stria terminalis (pallidum). This amygdaloid system gives output to hypothalamus and brainstem, but also a connection with the cerebral cortex exists, which in part was created after the development of the more recent cerebral neocortex. Apart from bidirectional connectivity with the hippocampal complex, this route can also be considered to be an output channel as the fornix connects the hippocampus with the medial septum, which is the most important input structure of the medial habenula. The medial habenula regulates the activity of midbrain structures adjusting the intensity of the misery-fleeing response. Within the bed nucleus of the stria terminalis the human homolog of the ancient lateral habenula-projecting globus pallidus may exist; this structure is important for the evaluation of efficacy of the reward-seeking response. The described organization offers a framework for the regulation of the stress response, including the medial habenula and the subgenual cingulate cortex, in which dysfunction may explain the major symptoms of mood and anxiety disorders. While there is broad agreement that early hominins practiced some form of terrestrial bipedality, there is also evidence that arboreal behavior remained a part of the locomotor repertoire in some taxa, and that bipedal locomotion may not have been identical to that of modern humans. It has been difficult to evaluate such evidence, however, because of the possibility that early hominins retained primitive traits (such as relatively long upper limbs) of little contemporaneous adaptive significance. Here we examine bone structural properties of the femur and humerus in the Australopithecus afarensis A.L. 288–1 ("Lucy", 3.2 Myr) that are known to be developmentally plastic, and compare them with other early hominins, modern humans, and modern chimpanzees. Cross-sectional images were obtained from micro-CT scans of the original specimens and used to derive section properties of the diaphyses, as well as superior and inferior cortical thicknesses of the femoral neck. A.L. 288–1 shows femoral/humeral diaphyseal strength proportions that are intermediate between those of modern humans and chimpanzees, indicating more mechanical loading of the forelimb than in modern humans, and by implication, a significant arboreal locomotor component. Several features of the proximal femur in A.L. 288–1 and other australopiths, including relative femoral head size, distribution of cortical bone in the femoral neck, and cross-sectional shape of the proximal shaft, support the inference of a bipedal gait pattern that differed slightly from that of modern humans, involving more lateral deviation of the body center of mass over the support limb, which would have entailed increased cost of terrestrial locomotion. There is also evidence consistent with increased muscular strength among australopiths in both the forelimb and hind limb, possibly reflecting metabolic trade-offs between muscle and brain development during hominin evolution. Together these findings imply significant differences in both locomotor behavior and ecology between australopiths and later Homo. Alzheimers disease is now the leading cause of death in the UK, but there are as yet no treatments to halt or reverse it. There was huge disappointment last week when the drug company Eli Lilly announced that a large, phase 3 clinical trial had failed to show any benefit to mild dementia sufferers from its antibody therapy, solenazumab. So where does this leave our basic understanding of biology of Alzheimers disease and how we might most effectively treat or cure it? Adam Rutherford talks to Alzheimers researcher Tara Spires-Jones of the University of Edinburgh. Also in the programme: The skeleton of the world's most famous fossil, Lucy, has received a body scan which revealed she spent a considerable portion of her life climbing trees. Researchers at the University of Bath are making smart bandages for burns patients which glow when their wounds become infected. Adam also talks to the astrophysicist who gave up studying exploding stars to apply his maths to Hollywood stars in the movie business. In the Arctic, the Inuits have adapted to severe cold and a predominantly seafood diet. Now, a team of scientists has followed up on the first natural selection study in Inuits to trace back the origins of these adaptations. The results provide convincing evidence that the Inuit variant of the TBX15/WARS2 region first came into modern humans from an archaic hominid population, likely related to the Denisovans. Q&amp;A: Mesenchymal stem cells — where do they come from and is it important? This is a source of much dispute within the MSC literature , . Stem cells are strictly defined by their ability to reconstruct the tissue of origin in vivo while also contributing to its maintenance and repair — thus demonstrating multipotency and an ability to self-renew. Stem cells differ from progenitor cells (or transient amplifying cells) that exhibit extended proliferative capacity and differentiation in vitro but have little ability to contribute to long-term tissue regeneration in vivo. Hematopoietic stem cells (HSCs) are the best characterized adult stem cells, and therefore are often used as a benchmark as to the level of evidence required to demonstrate the defining criteria of stem cells. HSCs can give rise to all blood cell components, including neutrophils, lymphocytes, natural killer cells, dendritic cells, macrophages and monocytes. MSCs derived from multiple sources have similarly been shown to give rise to osteoblasts, chondrocytes, adipocytes and reticular stroma. Stem cells also possess the ability to undergo numerous cell divisions while retaining their stem cell identity; that is, they have the capacity for self-renewal. For example, HSCs transplanted into irradiated mice can reconstitute the entire hematopoietic system while also giving rise to further HSCs that can be serially re-transplanted . Transplantation of bone marrow-resident MSCs gives rise to ‘ossicles’ composed of bone, cartilage and reticular stroma, as well as to a population of serially re-transplantable MSCs , . Despite this, there is very little evidence for long-term skeletal regeneration of MSCs in vivo. Transplantation of MSCs through intravenous infusion has resulted in little or no engraftment of cells to bone or bone marrow. However, intra-femoral injection of a subset of murine marrow stromal cells has shown limited engraftment at the site of injection 4–6 weeks post-transplantation, suggesting that the quality of the cells injected as well as the route of injection are major determinants of engraftment , . In other words, MSCs obviously self-renew in culture, which guarantees the sustained presence of regenerative cells over many passages and, accordingly, express factors known to regulate the self-renewal of other, better characterized stem cells . By contrast, whether MSCs re-transplanted in vivo behave like bona fide stem cells in terms of renewal is dubious. Regarding MSC natural origin in situ, quiescent perivascular cells presumably lose contact with blood vessels to be reprogrammed into stem/regenerative cells. Whether MSCs that arise this way also undergo self-renewal or are fully consumed in the tissue repair response is unknown. In fine, the self-renewing MSC might well be confined to the culture flask. Hobson and Friston have hypothesized that the brain must actively dissipate heat in order to process information (Virtual reality and consciousness inference in dreaming. Front Psychol. 2014 Oct 9;5:1133.). This physiologic trait is functionally homologous with the first instantation of life formed by lipids suspended in water forming micelles- allowing the reduction in entropy (heat dissipation), circumventing the Second Law of Thermodynamics permitting the transfer of information between living entities, enabling them to perpetually glean information from the environment (= evolution). The next evolutionary milestone was the advent of cholesterol, embedded in the cell membranes of primordial eukaryotes, facilitating metabolism, oxygenation and locomotion, the triadic basis for vertebrate evolution. Lipids were key to homeostatic regulation of calcium, forming calcium channels. Cell membrane cholesterol also fostered metazoan evolution by forming lipid rafts for receptor-mediated cell-cell signaling, the origin of the endocrine system. The eukaryotic cell membrane exapted to all complex physiologic traits, including the lung and brain, which are molecularly homologous through the function of neuregulin, mediating both lung development and myelinization of neurons. That cooption later exapted as endothermy during the water-land transition (Torday JS. A Central Theory of Biology. Med Hypotheses. 2015 Jul;85(1):49-57), perhaps being the functional homolog for brain heat dissipation and consciousness/mind. The skin and brain similarly share molecular homologies through the ‘skin-brain’ hypothesis, giving insight to the cellular-molecular ‘arc’ of consciousness from its unicellular origins to integrated physiology. This perspective on the evolution of the central nervous system clarifies self-organization, reconciling thermodynamic and informational definitions of the underlying biophysical mechanisms, thereby elucidating relations between the predictive capabilities of the brain and self-organizational processes. A study recently published in PLOS Biology provides information that substantially changes the prevailing idea about the brain formation process in vertebrates and sheds some light on how it might have evolved. No cerebral cortex or exclusive region giving rise to the formation of the vertebrate midbrain has been detected in amphioxi. However, a common territory inside the forebrain has been found, which they termed DiMes (Di-Mesencephalic primordium), from which both the midbrain and other important structures of the classic forebrain would derive. The DiMes territory yielded three important regions of the vertebrate brain that are used to process sensory information. "The three classic vertebrate cerebral regions (thalamus, pretectum and midbrain) would have emerged evolutionarily through the action of molecular signalling centres that lead to the expansion and division of a DiMes-like portion," said Manuel Irimia of the Centre for Genomic Regulation (CRG) of Barcelona, one of the leading investigators of the study. This explains that if the function of these signalling centres, called secondary organizers, is eliminated in vertebrates there remains a single territory similar to the one observed in amphioxi. The study of the formation of these three important parts of the brain, which vertebrates use to process visual, auditory or propioceptive information (on the position and movement of the parts of the body), is useful in understanding how the brain has adapted to the environment and is capable of processing information around it. Common chimps and bonobos are our closest living relatives but almost nothing is known about bonobo internal anatomy. We present the first phylogenetic analysis to include musculoskeletal data obtained from a recent ﻿dissection of bonobos. Notably, chimpanzees, and in particular bonobos, provide a remarkable case of evolutionary stasis for since the chimpanzee-human split c.8 Ma among >120 head-neck (HN) and forelimb (FL) muscles there were only four minor changes in﻿ the chimpanzee clade, and all were reversions to the ancestral condition. Moreover, since the common chimpanzee-bonobo split c.2 Ma there have been no changes in bonobos, so with respect to HN-FL musculature bonobos are the better model for the last common ancestor (LCA) of chimpanzees/bonobos and humans. Moreover, in the hindlimb there are only two muscle absence/presence differences between common chimpanzees and bonobos. Puzzlingly, there is an evolutionary mosaicism between each of these species and humans. We discuss these data in the context of available genomic information and debates on whether the common chimpanzee-bonobo divergence is linked to heterochrony. Differences between head muscles of common chimpanzees, bonobos and modern humans. There are no major consistent differences concerning the presence/absence of muscles in adult common chimpanzees (left) and bonobos (center), the only minor difference (shown in grey in the common chimpanzee scheme) being that the omohyoideus has no intermediate tendon in bonobos, contrary to common chimpanzees (and modern humans). In contrast, there are many differences between bonobos and modern humans (right) concerning the presence/absence of muscles in the normal phenotype (shown in colors and/or with labels in the human scheme). See text for more details. 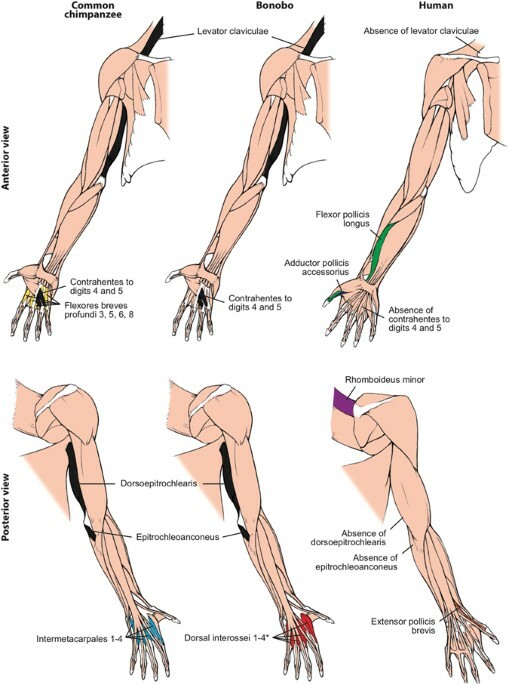 Differences between forelimb muscles of common chimpanzees, bonobos and modern humans. The only consistent difference between bonobos (center) and common chimpanzees (left) concerning the presence/absence of muscles (shown in colors in the common chimpanzee and bonobos schemes) is that in the former the intermetacarpales 1–4 are usually fused with the flexores breves profundi 3, 5, 6 and 8 to form the dorsal interossei muscles 1–4 (* in bonobo) figure, as is the case in modern humans. In contrast, there are many differences between bonobos and modern humans (right) concerning the presence/absence of muscles (shown in colors and/or with labels in the human scheme; muscles present in chimpanzees and not in humans are shown in black, in chimpanzees). See text for more details. 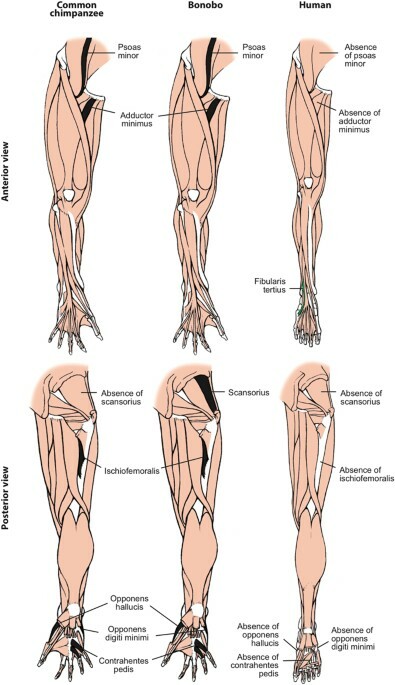 Differences between hindlimb muscles of common chimpanzees, bonobos and modern humans. The only consistent difference between bonobos (center) and common chimpanzees (left) concerning the presence/absence of muscles (shown in colors in the common chimpanzee scheme) is that the latter usually lack the scansorius, as is the case in humans. In contrast, there are many differences between bonobos and modern humans (right) concerning the presence/absence of muscles (shown in colors and/or with labels in the human scheme; muscles present in chimpanzees and not in humans are shown in black, in chimps). See text for more details. Last edited by Jo Bowyer; 26-05-2017, 06:44 AM. How do neurons become neurons? They all begin as stem cells, undifferentiated and with the potential to become any cell in the body. Until now, however, exactly how that happens has been somewhat of a scientific mystery. New research conducted by UC Santa Barbara neuroscientists has deciphered some of the earliest changes that occur before stems cells transform into neurons and other cell types.